Who says 'NO' to this love? Any body from the crowd? I, the nutella addict bookmark all nutella recipes but finish nutella without preparing any of them. 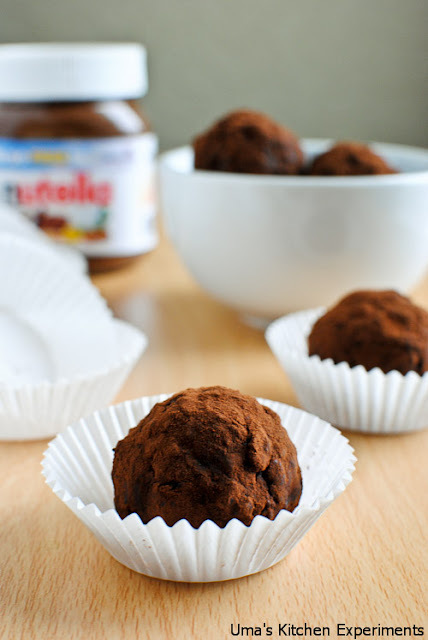 I bookmarked Nutella truffles from Deesha's blog during my random visit to her blog. Somehow, I showed my interest to save some nutella and prepared these truffles. But before me, my blogger friends Raks and Jeyashri have showed their love of nutella through their post by preparing this easy truffles. 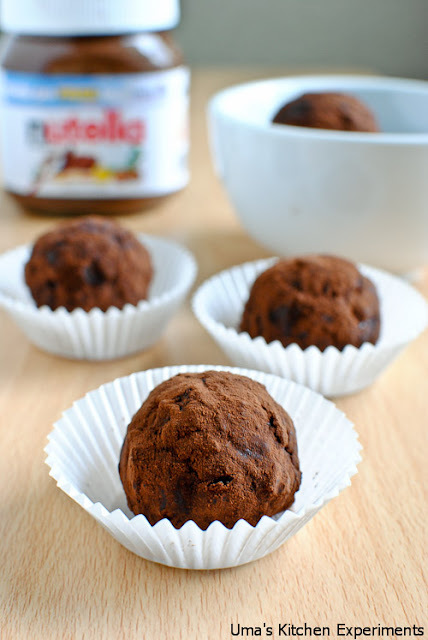 I am sure, you show your love of nutella by preparing these truffles after reading this post. 1) In a microwave safe bowl, melt butter and nutella together for 2 minutes. Transfer it to a mixing bowl. 2) Add crushed biscuits and cornflakes. Mix them well. 3) Keep the mixture aside till it reaches to room temperature. 4) Make small balls out of them. I was not able to make balls out of the mixture. So I added 2 tablespoons of milk to the mixture and made balls. 5) Roll the balls in the cocoa powder. 6) Keep inside the refrigerator for 30 minutes and serve chill. 1) Add more nutella if you LOVE nutella. 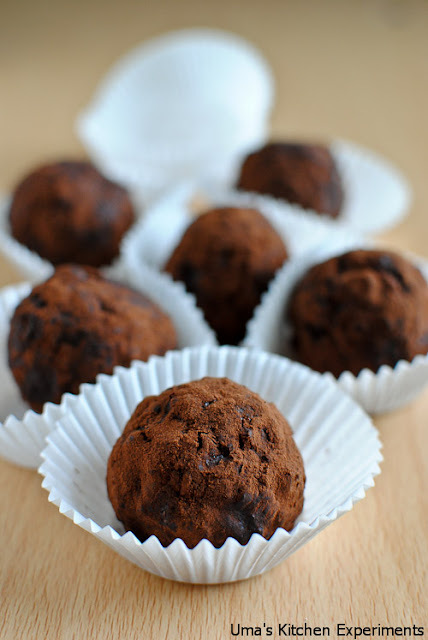 2) As we added milk, you can store this truffles only up to 8 hours after the preparation. 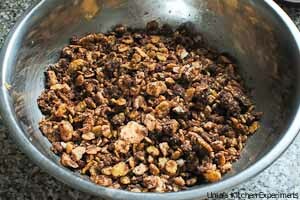 3) Add your favourite nuts for additional taste. 4) You can also add roasted oats along with cornflakes. Looks awesome!..love anything with nutella..
Now I too am tempted to make these, these are gorgeous. Lovely clicks. Looks awesome !! perfectly done and very tempting clicks !! 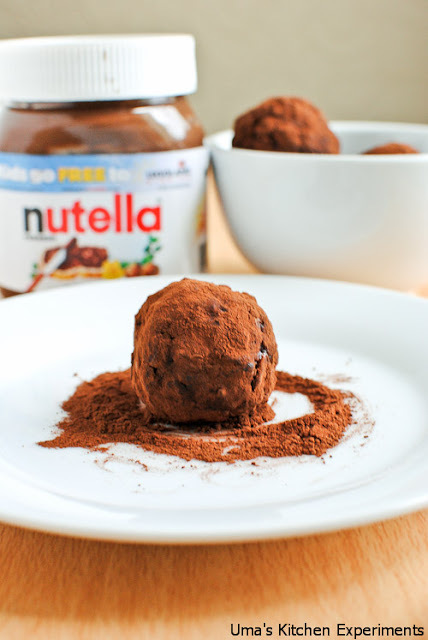 Beautiful Nutella truffles, absolutely lovely. Lovely clicks has tempted me to make some now. I can't wait to take it for a spin with this recipe! 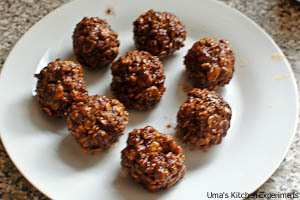 Perfect truffles Uma .. nice clicks.